There is a difference between how successful bodybuilders train, and how “everyone else” does. That is the basic premise of this book. If you watch someone like Lee Haney going through a weight training workout, you will see a difference in how they approach it relative to everyone else. It’s not just about this or that number of reps, or whether or not you “train hard.” Successful bodybuilders approach their training sessions differently than those who spend years spinning their wheels. This book is about the concentration it takes when you’re inside the weight room. It’s about how to get the most out of every rep, of every set, of every workout. Yes, it’s about the mind-muscle connection. It’s about listening ti internal cues, your muscles, and your body. 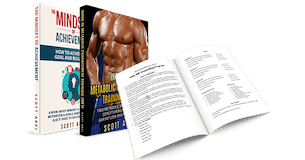 It’s about how to approach weight training and bodybuilding intelligently and with the right mindset. It’s about training hard, without training just your ego. It’s not about watching the clock or counting out a certain tempo. It’s about learning to listen to your body. There is info here about workout program design, muscle soreness and DOMS (what’s acceptable, what isn’t), the truth about tempo training, rest times, exercise range of motion, what makes for so-called “heavy” training, listening to your body and its internal cues, and more. This book is not a workout program or a weight training program. It’s about how to approach every bodybuilding workout program. Learn what true bodybuilding training really looks like and feels like.